Back again, bragging about my students. 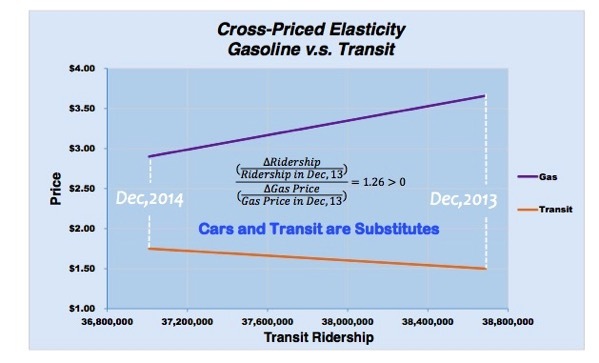 We were working primarily with own-price elasticities, which are a problem simply because transit is not the only option, and price changes in other modes can influence demand as well. Well, one of my wonderful students, visiting USC Price from USC Viterbi Jinhao Mai found us some data on gas prices. Gas prices are not helping Metro at all after their price change. How do you feel about having 2014 first year instead of 2013? Maybe we should flip em?